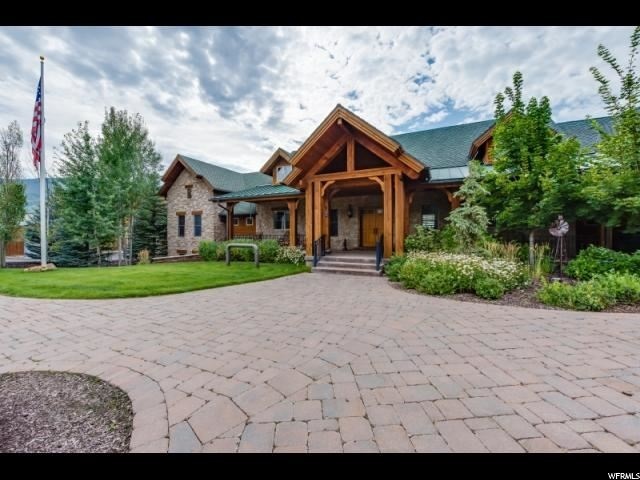 This Equestrian Ranch Estate is located in the Wasatch Back valley of Wallsburg, UT. Wallsburg is a small town located near Deer Creek Resivor, off Utah Highway 189. This little town is located between Sundance and Heber City with close proximity to Park City. Wallsburg provides the best getaway for a Wasatch mountain valley retreat. This Equestrian Estate has been constructed with high-quality workmanship and quality materials to create an incredible atmosphere. You can enjoy amazing summer days on the large deck, play tennis, or simply relax next to the fountain and enjoy the beautiful mountain views. Stay comfortable in this large 12,328 Square Foot home during the winter months with radiant heat, forced air, and two beautiful fireplaces. Enjoy scenic mountain and valley views through the large vaulted windows year round. This luxurious estate is handicap accessible with an elevator and full kitchens on both floors. An amazing amount of detail was put into the layout of the complex with a 20,000 square foot indoor arena, 16 stalls and a kitchen. The two-story extra wide tack room has plenty of space for all of your equestrian needs. The 29.60 acres are fully fenced with automatic pivot for pasture irrigation. The Equestrian Ranch Estate also features a professional dog run with a septic system, drive through access, large pens, automated watering system, professional grooming area and more. It is truly something you have to see in person.